In spite of what the weatherman said was going to happen, the clouds broke and blue sky showed through and a 14K SE breeze greeted Lisa, Colin and Captain Ed on Siesta on our annual reposition cruise. ​ on their new Corsair 32 Tri taking advantage of the weather as well. ​We were thinking of those who wanted to be there but couldn’t make it, But next year will be a different story and we look forward to it. Thanks Ed for a wonderful cruise. Our April meeting was held at the home of Colin Parker and Susan Ruck. Present were Margo and Larry Murray, Mike Bier, Paul Koisch and Colin. Our end of the season last meeting was mainly partying as we feasted on Paul’s meatballs, Mike’s kosher pigs in a blanket, Colin’s famous fried fish fingers and coleslaw and Margo’s kale salad topped off by her incredible brownies, all outdoors under the stars. Larry gave his Treasurer’s report even though we did not have a quorum. We have 23paid members this year and our savings is in strong financial condition. We did receive a very nice thank you letter from KAIR, to whom we donated money at Christmas time. Old Business had two bright spots and they were some fantastic sunfish sailing last week and a great kayak at Jeanette’s. For weather related reasons, the Sailing Clinic and Fiesta Key had to be canceled. Under New Business the Luna Sea day sail has been canceled do to equipment problems and Kayaking at Judy’s was canceled do to schedule conflicts. I know it looks like we have a dark cloud under us all the time, but it’s not true because the season is not over yet and we have some fantastic weather ahead. Bon Voyage to Barb and Bob Cooley and Paulla and Dean Martin who are heading north. Safe travels!! Fair winds to Chris Anderson who is on a boat delivery to St. Thomas. A quick recovery to Lisa Schultz who had a fall and could not make the meeting. Our thoughts and prayers are with Margo Murray who will be undergoing a procedure next week at the Mount Sinai Medical Center. Good Luck Margo!! Our next meeting will be at the home of Margo and Larry Murray on November 9, 2017. The meeting was adjourned at 9:00PM. Saturday was a beautiful day and what a day to be out sailing again. Mike, Tom, Chris and Colin joined Bob And Barb who were out on the Committee boat, for sunfish racing at Coco Plum Beach. The weather was middle 70’s, clear blue skies and winds were 15 decreasing to 5 gusting to 10 shifty N-NW winds. Bob and Barb ran 11 impeccable races even changing the windward mark as the wind shifted to the west. Colin took honors with 6 wins and Tom was close with 4 wins. Mike and Chris shared boats, with Mike getting a first and Chris was always in the mix and doing well, being the first time racing these boats. Many thanks go to Barb and Bob who did a great job placing the marks, running the races and keeping score. After the races, Tom and Colin joined another friend and went out for a sail on Tom's new 32’ Corsair catamaran. The wind was up to about 15K and we zipped along doing 10 to 14ks. What a blast! Thanks Tom for that experience. home at Trailer Ranch. We had perfect weather, clear, sunny, 80’s, and 10-15K winds out of the east. This is a very interesting Island with lots of birds roosting; pelicans, cormorants, herons, anhingas and a great tunnel. Continuing on over to the shore, we went through many interesting tunnels through the mangroves. Spotted were a snake, and a ray. At that point, we split up, one group continuing on to Sombrero Beach and the other heading back exploring the mangroves along the way. With 80 degree weather, clear sky and 15k winds we had an ideal day to kayak. Sombrero Beach was too crowded with spring breakers for our cars so we went to Curry Hammock. Barb and Bob Cooley, Barb’’s friend Sheila, Paulla, Ruth and her daughter, Dale and Colin had a great paddle around Curry Hammock. Some of us even went out to the sand bar which was beautiful. THIS THURSDAY AT 6:00PM, CITY MARINA. Last Wednesday a group of us kayaked around the Valhalla Quarry on Grassy Key. Barb and Bob, Barb’s friend Shiela, Paulla and her friend Judy and Susan and Colin ventured out through the opening at the quarry to see what we could find. In beautiful clear shallow water we saw nurse sharks, barracuda, schools of parrot fish and blue crabs. Along the shore in the mangroves, great white herons, ibis, white egrets and a little blue heron were sighted. There were many little places in the mangroves to duck into, no boats, no wakes, no noise, sheltered from all winds out of the east -- just a great place to kayak. We all had a great time and said we would too it again. In the next couple weeks look for announcements because we have lots coming up— our next meeting, kayaking, Splicing Party and sunfish sailing. Five sailors went up to Ft. Lauderdale to race CR 914’s in the Midwinter Championships. The weather was beautiful with sunny sky, temps in the low 80’s and winds NE 5-10 and gusting higher. ​Three of us started to move up in the ranks by scoring firsts, Ted Reinhold, Ted Smith and Colin and Mike was showing some good boat speed in some races. Unfortunately, Paul had his share of problems with Halcyon once again having electrical problems that baffled us all. Congrats to Paul for sticking it out and trying to work out the problems right to the end. Congrats or condolences go to Colin who received the award for the best scoring skipper over 70. As it turned out we all had a great day. The annual Valhalla Regatta was held at the Valhalla Quarry in Marathon, Florida. There were 10 entries representing the South Florida Model Racing Club and the Marathon Sailing Club. Winds were light and variable out of the south, clocking to the west, so they were a bit of a challenge for the sailors as well as our mark tender. 10 races were completed with a lunch break in the middle. The first 3 places were tightly contested with the 2nd place boat winning the last 2 races. The top 3 skippers received awards. Summary of the 2017 Valhalla Regatta: Entries: 10 , Winds: 5-7, Scoring: Low point - 1 throw out Race Committee: Colin Parker RD, Susan Ruck, Barb Cooley Score keepers and food, Bob Cooley, marks and crash boat. ​Mike Bier held a sailing clinic, the boats were prepared and sailing followed. 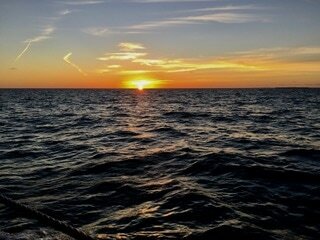 15 Club members joined us on a most memorable sunset cruise on the Appledore II out of Key West on Thursday. Aboard the 60’ Schooner were Sue and Jim Berry, Barb and Bob Cooley, Ted and Carol Reinhold, Judy Rowley and Paul Koisch, Margo and Larry Murray, Paulla and Dean Martin, Lisa Schultz, Sue Ruck and myself. The weather could not have been any nicer with clear skys, a 10K southeast wind and temps in the high 70’s. And to top it off some of us even got a glimpse of the Green Flash! Much thanks goes to Sue Ruck for organizing the trip. We definitely want to do this trip again!! For more photos visit our website. Ted has just downloaded many on our site. www.marathonsailingclub.org. ​ Our March meeting was held at the residence of Barb and Bob Cooley. Present were Paul and Judy, Margo and Larry, Paulla and Dean, Carol and Ted, Mike and Colin. There were lots of appetizers and Barb made up some great ham sandwiches with all the fixings. The meeting started at 7:15PM and the minutes were accepted as reported. Larry gave the Treasurer’s report. There are 23 members in good standing and the Club is in good financial standing. Colin also reported that the Valhalla Regatta cost the Club a total $61.39 and that will be reported in next month’s statement. Ted Smith, who sailed the Club boat Killian Red, made a contribution to the Club of $20, and that money was used to offset regatta expenses. Thanks very much Ted! In Committee Reports, Mike reported that the Splicing Party will be next Thursday, March 16th at the City Marina. We are hoping for a good showing. Much thanks to Mike for making this important community service happen again and to Paul for printing out beautiful flyers. Paul reported on the Valhalla Regatta. The Ft. Lauderdale folks took the first 3 places but one of ours, Ted Smith, finished 4th - so we are moving up. There was some problem with seaweed, so we are actively looking for alternative sites. All 10 boats enjoyed themselves and it was a great regatta in all, with much thanks to our Race Committee of Sue Ruck doing food pick-up and scoring, Barb Cooley doing food pick-up and scoring, and Bob, in the kayak, doing marks and rescue. Colin reported on the CR 914 Midwinters in Ft. Lauderdale. There were only 9 boats but still a fun regatta. Paul experienced electrical difficulties and could not finish many races. Colin got 4th and the award for best scoring sailor over 70. Oh well!! March 18th Sailing Clinic: PLEASE RSVP me if you can make it and if you want instruction or just want to sail or race. March 25th FIESTA KEY LAND AND SEA CRUISE: PLEASE NOTIFY MIKE if you need a boat! April 8th SUNFISH RACING Coco Plum Breach. Keep a look out for our upcoming activities of sailing, RC sailing and kayak trips! Hopefully we can do our day sail on the beautiful “Siesta” if schedules work out. The meeting was adjourned at 9:00PM and the next meeting was set for April 13th at Colin’s house. Many thanks to the Cooley's for their hospitality and great food spread. Safe trip home to Carol and Ted Reinhold who will be leaving soon for much colder climes! Our February meeting was held at the home of Ruth Olson and Steve Schultz. Present were Colin and Sue, Paul, Margo and Larry, Mike, Jeanette, Lisa, Chris and a special surprise, Peggy Forberg and her sister Barbara in from Colorado. In Committee Reports Mike reported that the Annual Splicing Party will be held on: MARCH 16TH 6PM MARATHON CITY MARINA The Marine Sanctuary will be there with all the lines and help. Food and Beverages served. Thanks Mike for setting this up and thanks Paul for printing out beautiful flyers. Ruth will make sure this gets out on the Boot Key boater’s web. Ruth reported on the Marathon Yacht Club Educational Foundation (MYCEF) Community Celebration to support the Middle Keys Sailing program. It will be held on Wednesday, Feb 22nd. from 4 to 6 PM at the City Marina. Also MYCEF is holding a Benefit Bash for the same cause, to be held on Thursday, March 2nd at the Marathon Yacht Club. Tickets are $85 pp ($58 tax deductible) including music (Howard Livingston Trio), dancing, food and silent auction. A great way to support our local kids. Thanks for all your work on this project, Ruth. ​Sue Ruck reported that we had a very successful trip on the Schooner Appledore out of Key West with 18 members and friends participating. It was a breathtaking evening with a beautiful Green Flash sunset. We will definitely do this again. Thanks Sue for putting this trip together. In Old (Very Important) Business, Peggy Forberg announced that on February 18th, Saturday Andy Forberg’s ashes will be spread in the morning and a reception will be held that day at 3-5PM at 450 12th Street, Key Colony Beach. Our friend and fellow sailor crossed over the bar May 9, 2015. We miss him very much. Thank you Peggy for being here and letting us share in the celebration of Andy’s life. New Business: Coming up is our Valhalla Regatta. On Feb. 18th in the AM we will be sailing Victorias, CR 914’s and Dragon Forces at Valhalla Quarry. Start time 10:00AM. Feb. 19th Valhalla Invitational CR 914 Regatta; $15 fee for participants, Skipper’s meeting 9:30, racing 10:00, lunch 12:00, racing 1:00, awards 3:00PM. Helpers: Breakfast pick-up - Sue Ruck Lunch pick-up - Kayak- Bob Marks - Mike Tent - supplied by MYCEF - Ruth & Colin Scorers - Sue Ruck Any other help would be greatly appreciated so we can show our hospitality to our Ft. Lauderdale friends. The CR 914 Midwinters will be held on Feb 26th in Ft. Lauderdale and we expect to send a contingent up to represent the MSC. Sunfish sailing: Saturday has been postponed because of wind until Sunday. March 11th was changed to March 18th because of conflicts. Check the SCHEDULE BELOW for all updates. UPCOMING: Day sail on “Siesta” Also discussed was the possible resurrection of the Sombrero Cup and / or Marathon To Key West Race. We are putting out feelers to see if there is interest. ​Next Meeting: The next meeting will be held at the Cooley’s on KCB on March 9th at 6:30PM. The meeting ended at 9:00PM. A special thank you to Ruth and Steve for hosting this meeting and serving up that delicious chili. Our January meeting was held at the home of Susan Ruck and Colin Parker. Present were new members Lisa Schultz and Chris Anderson. Welcome aboard! Also present were Margo and Larry, Paul, Barb and Bob, Sue and Jim Berry, and Mike. After partaking in a great spaghetti dinner hosted by Susan Ruck the meeting was started at 7:30. The previous minutes were accepted as reported. Larry gave the Treasurer’s Report. The Club is in sound financial standing. The Christmas Party partially funded by the Club, only cost the Club $216. Larry announced that DUES ARE DUE: $50 SINGLE $75 COUPLE SEND TO: MARATHON SAILING CLUB PO BOX 522746 MARATHON SHORES, FL 33052 Thank you Larry for all your work that the Christmas Party involved. I also reported that our 2017 State Of Florida Corporation Tax has been paid. In Committee Reports, Mike reported that there are new folks in the Marine Sanctuary he is dealing with and will have more information on the Splicing Party at the next meeting. Chris reported the Youth Sailing Program is looking toward the future. Funding is the main focus now. With that in mind the Benefit Bash will be held at the Marathon Yacht Club with all proceeds going to the Tax Deductible Educational Foundation Sailing Program. Thanks for all your volunteer work you do for the program, Chris. In Old Business, I reported that Peggy Forberg will be spreading Andy’s ashes on either Feb.17th or 18th. We hoped that those of us who have small boats could participate. There will be a reception on KCB afterwards. More information will follow. In New Business, Paul made a motion and Bob seconded that Colin Parker be retained as Commodore and Larry Murray be retained as Treasurer. The vote was unanimous. The next meeting was set for February 9th at Ruth Olson’s home at 6:30PM Much thanks to Susan for hosting our fabulous dinner meeting. it was very much appreciated and enjoyed by all. Our first meeting of the season was held at the home of Margo and Larry Murray. After great hors d’oeuvres and drinks the meeting was started at7:15PM. Present were Susan Ruck, Barb and Bob Cooley, Ruth, Mike,Margo and Larry, Susan and Al, Daisy and Ed, Paul and Judy and Colin. Larry gave the Treasurer’s Report. The Club is in Sound financial standing. Under Committee Reports, Colin reported on an outing he had in which Gary Jobson was guest speaker. Gary spoke about the Olympics and in particular how Finn sailor Caleb Paine won our only medal in sailing; a Bronze Medal, by being exonerated in a protest mainly through the efforts of Gary appealing to the Olympic Protest committee. Championships which they raced in very rough conditions in Islamorada. Susan placed 1st in the woman’s division and Al placed 2nd in the Silver Fleet and was 1st in the Senior division. Congratulations!! Al also reported on the Full Ironman Competition he completed in Panama City. It was extremely grueling but Al managed to finish and best his time by more than an hour. Congratulations again on finishing such a race. Under Old Business, Ruth reported on the Community Sailing Program. The summer sailing with Capt. Chris went beautifully with 46 youngsters participating at The City Marina in Marathon. What a success story! But what is needed now for the new year is more money. One important way of raising that money is the Benefit Bash held at the Marathon Yacht Club next year on March 2, 2017. Ruth is already looking for tax deductible donations for the auction at the Benefit Bash. Hopefully the Community Sailing can be continued and expanded next year. CR914 Midwinters - Feb 26.
going to shoot of the 2nd week in March. Thanks Mike! The Christmas Party was next on the agenda: It was decided to have it at the Marathon Yacht Club this year on Dec. 22nd. We discussed price at length and it was decided that each member in good standing, will pay $25 and the Club will pick up the remainder. The total cost is $36 per person so that will be the price for guests. That is a great deal and we look forward to a large response and attendance. *** Note— Mike will be in charge of reservations so if you are planning to attend call or email him with your food choice and if you are bringing or are a guest—VERY IMPORTANT by DEC 15th. Look for the flyer in the mail very soon! The next meeting was set for Jan 12, 2017 at the Parker house at 6:30PM.